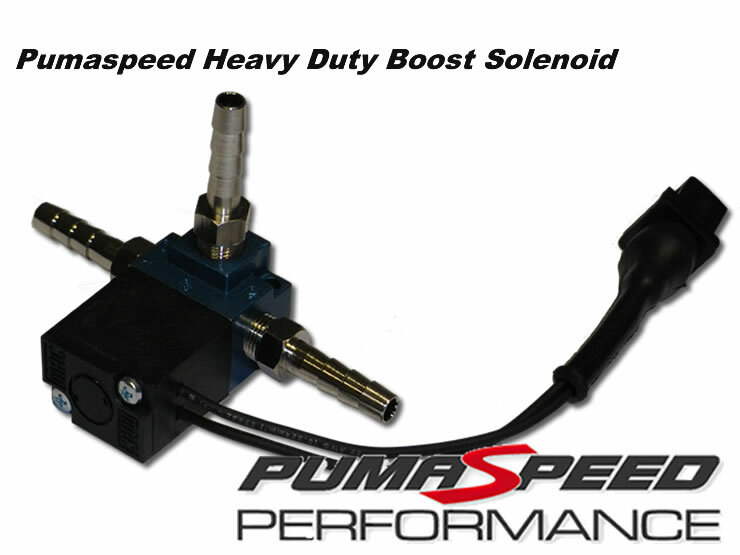 Pumaspeed now launch their own version of the ever popular Heavy Duty Boost Solenoid. This new unit is a higher spec than the silver coloured units already available..
the Valve comes complete with metal fittings not the plastic type which are prone to cracking and breaking. The faster switching speed of this new boost valve and accuracy boost control allows the car to perform and deliver boost in a far better way, it works best with all remapped vehicles. Which way around do the pipes go ? .If you are in any doubt whatsoever please print this page and take the Pumaspeed uprated solenoid valve to a professional workshop for installation. Please Note: These instructions are ONLY for the Pumaspeed Valve, other makes of valves are piped up differently and do not work with the same port conections. The Pumaspeed Workshop team are ready to fit the Pumaspeed Focus Heavy Duty Boost Solenoid in our Head Office located here. We estimate the labour time to be approximately 0.33 hour(s) costing £25.74 inc VAT. Therefore making parts and labour a total cost £104.74 (inc. VAT). Pumaspeed have a specialist distribution team that can dispatch the Pumaspeed Focus Heavy Duty Boost Solenoid to any destination worldwide.